October 1 to 5, 2012. Re-electionists, former officials, incumbents’ relatives, and fresh faces rushed to COMELEC offices to file their Certificates of Candidacy for the May 13, 2013 midterm elections. Twelve Senate seats, nearly 300 House seats, and all local elective positions from provincial governor to town/city councilor are at stake. The 2013 polls will mainly be a contest between two political “super-groups” organized in 2012: the LP-NP-NPC-LDP-Akbayan coalition, and the United Nationalist Alliance (UNA). It would pit Pres. Benigno Aquino III, Liberal Party (LP) chairman and de facto leader of the first coalition, against Vice Pres. Jejomar Binay, among UNA’s “three founding fathers”. Struggling to complete its 12-person senatorial slate to fight the UNA “political powerhouse” by itself, LP managed to secure alliances with Nationalist People’s Coalition (NPC), Laban ng Demokratikong Pilipino (LDP), the Akbayan party-list, and its main erstwhile 2010 elections opponent, the Nacionalista Party. The partnership would be confusing in some local areas, where LP, NP and NPC candidates would be facing each other at the polls. Both UNA and the LP-led coalition have nine distinct Senatorial candidates and share three “guest candidates”: Sens. Loren Legarda and Francis Escudero, and former MTRCB Chairperson Grace Poe. Completing the 33-person Senate contest would be three candidates from Ang Kapatiran Party, three from the Democratic Party of the Philippines (DPP), Bayan Muna Rep. Teodoro Casiño of the progressive Makabayan coalition, two-time presidential candidate Bro. Eddie Villanueva of Bangon Pilipinas, lawyer Samson Alcantara of Social Justice Society party, and three more independent bets: former Puerto Princesa Mayor Edward Hagedorn, former police chief Ramon Montaño, and businessman Ricardo Penson. Lakas-CMD (the ruling party under Pres. Gloria Macapagal-Arroyo’s tenure) and the newly-created National Unity Party (consisting of Lakas-CMD defectors to LP) chose to field no candidates for Senator. As of 2012, both parties have not endorsed any Senatorial candidate. 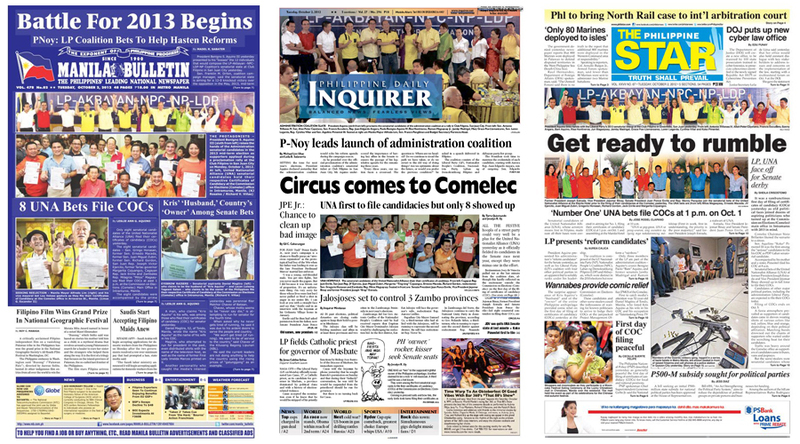 “Front Pages” is Pinoy Index‘s way of looking back at notable events of the year through the front pages of Manila Bulletin, Philippine Daily Inquirer, and The Philippine STAR. Tags: 2012, 2012 in review, 2013 elections, bulletin, COC filing, cover pages, front pages, inquirer, manila bulletin, philippine daily inquirer, philippine star, philippines, philstar, the philippines. Bookmark the permalink. LP line up, no doubt. daming mahuhusay na kandidato ah! AYOS! Si chiz lang talaga yung pinaka hassle.. kadiri showbiz..